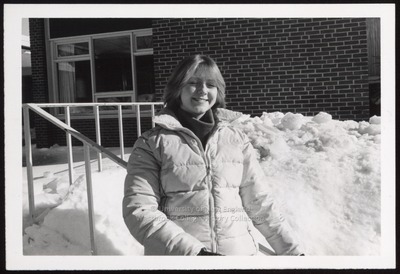 "Marji Harmer Beem, Westbrook College, Class of 1977"
Westbrook College student Marji Harmer Been, Class of 1977, was a Dental Hygiene major and a Day Hop. For her senior class candid photo, she wore a white or off-white quilted winter jacket and a dark turtle neck jersey. Her hair was just shoulder length with bangs, parted in the middle and feathered back on the sides. Marji stands on the patio stairs in front of Alexander Hall and to the side of Linnell Hall.